Remember that I said to put away a painting for a few months or so while you keep painting and when you pull it out you will be amazed and pleased with your progress as you compare the old to the new work? Well out of the blue, I just received a photo of a painting I did in 1989 from the friend who has it. She just purchased another painting from me, and I had asked her to send a photo of the painting hanging in her home for my portfolio. She sent two, one of the new one and this one. When I saw the photo I was thrilled, but I laughed when I studied the painting. Just as I told you, I saw a tremendous difference in my work from that time to now, and it was a true eye opener! I don't even remember if it is in oils or acrylics. When I painted it, I was so proud of the work! 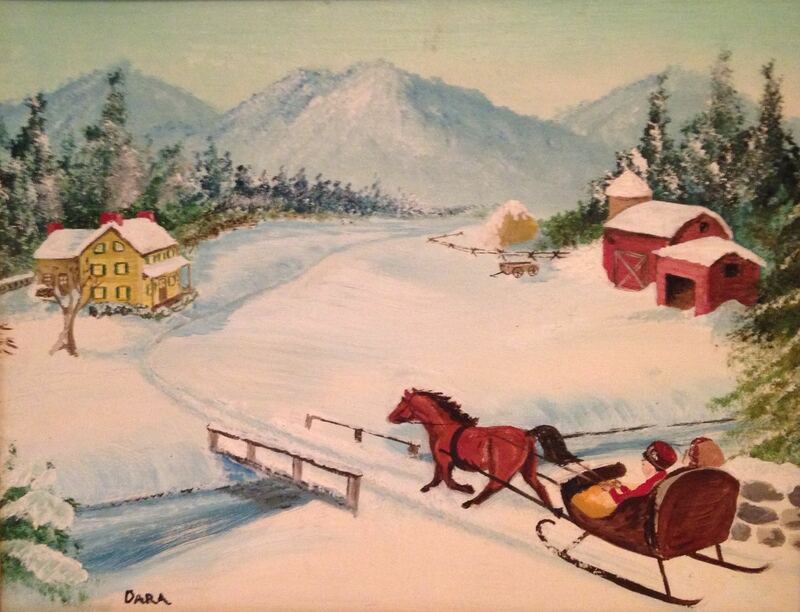 It was a snow scene, very hard to do, and add to that a horse and sleigh heading towards a house in the distance. It wasn't easy but I thought at the time that it was great. Now, I just laugh because I see all the mistakes I made. Don't get me wrong, it's not too bad, but it could be so much better. I am very happy that it came and I will keep that photo forever as a reminder of where I used to be in my work. You need to do the same. The photo is below. I don't know if I gave it a name, and I'm not sure of the size, but it seems like it was between and 11 x 14 and a 14 x 18. Anyway enjoy the photo and be sure and save at least some pictures of your "older" artwork for comparison later. It will be good for your psyche! I'm going to name it now! "OVER THE RIVER"